Featured in our collection of Short Stories for High School. 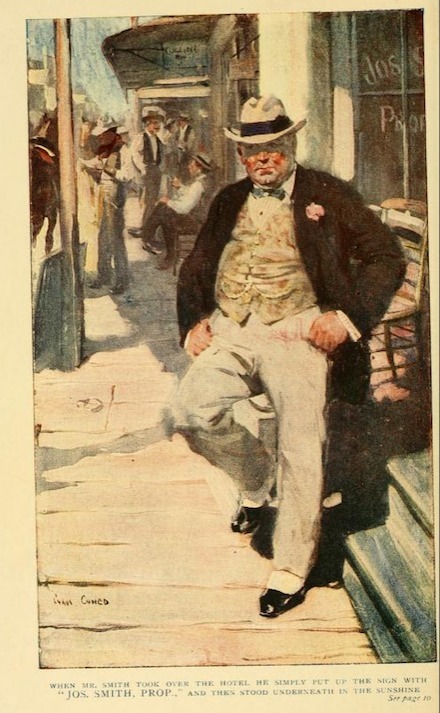 Like Sherwood Anderson's Windesburg, Ohio, Stephen Leacock's Sunshine Sketches of a Little Town (1912) is a sequence of short stories or vignettes about the people that populate a small town. "Mariposa is not a real town. On the contrary, it is about seventy or eighty of them. You may find them all the way from Lake Superior to the sea, with the same square streets and the same maple trees and the same churches and hotels." Josh Smith, proprietor of Smith's Hotel, one of the leading citizens of the town. Jefferson Thorpe, owner of the barber shop, who engages in mining speculations. Golgotha Gingham, the undertaker, to whom people are less interesting when still alive. Dean Rupert Drone, reverend of the "Church of England Church," who has to deal with the debt from building a new church. Peter Pupkin, a bank teller who loves the Judge's daughter. Zena Pepperleigh, Judge Pepperleigh's daughter. She likes to read romantic stories. Dr. Gallagher, collector of Indian relics and student of Canadian history. Mr Hussell, journalist for the Mariposa Newspacket. Christie Johnson, captain of the Mariposa Belle. Henry Mullins, manager of the Mariposa Exchange Bank. Narrator, an Unreliable Narrator, whose descriptions of the town are biased or absurd. Return to the Stephen Leacock library.